Step up your play card drawing skills with the new line drawing tools in version 1.7.675 of Football Play Card. Coaches and players will now be able to draw their own routes, blocks, coverages, rushes, and blitzes with four different line endings, two line styles, three line weights, and five line colors. To use the new drawing tools, simply select a player and then select the “Draw” option from the context menu. Next, click and drag the line where you want it to go. To add another segment to the line, click the line ending (arrow, block, circle) and the next segment will appear. You can then add and drag as many new line segments as you would like. To change the line ending, style, weight, and color, select the “Drawing Options” button and select your line attributes. 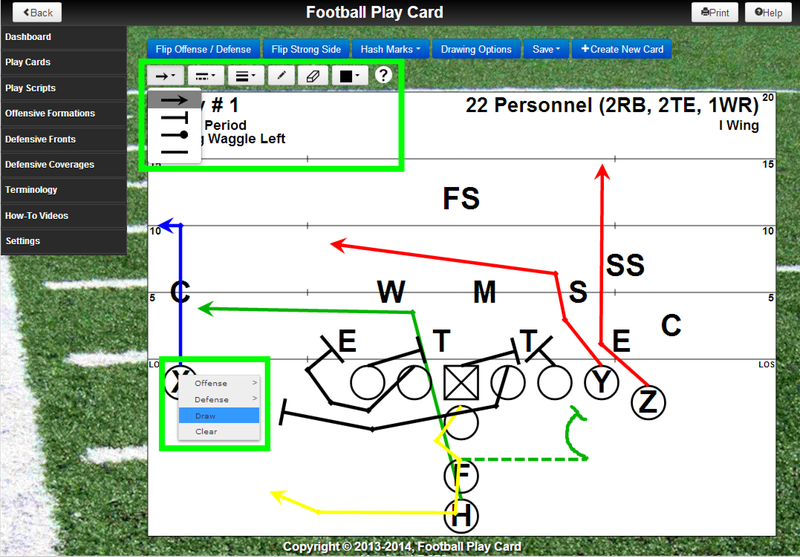 This entry was posted in New Functionality and tagged Draw Play Cards, Drawing, Football Play Card, New Functionality, Play Cards. Bookmark the permalink.